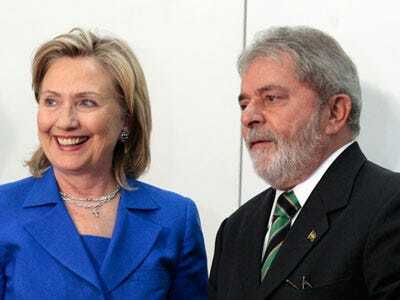 Hillary Clinton’s Latin American tour struck out in a major way when Brazil rejected her plea for participation in sanctions against Iran. Hillary’s offer amounted to desperation: if the U.N. Security Council (of which Brazil is a temporary member) does not approve sanctions, Iran will not bargain on its nuclear program. Brazil’s foreign minister was not impressed: “We will not simply bow down to an evolving consensus if we do not agree. We have to think by ourselves and with our values and principles,” Celso Amorim said, according to Ria Novosti. All despite Hillary’s decision to wear a silver cross necklace, a token of deference to the Catholic nation. Brazil’s rebuke is another sign that the era of US regional power is over.